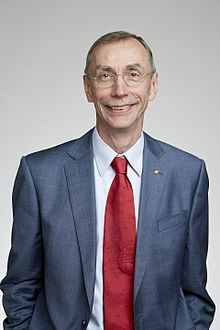 Svante Pääbo ([ˈsvanːteː ˈpæːboː]; born 20 April 1955) is a Swedish geneticist specialising in the field of evolutionary genetics. As one of the founders of paleogenetics, he has worked extensively on the neanderthal genome. Since 1997, he has been director of the Department of Genetics at the Max Planck Institute for Evolutionary Anthropology in Leipzig, Germany. Pääbo was born in Stockholm and grew up with his mother, Estonian chemist Karin Pääbo. His father was biochemist Sune Bergström, who shared the Nobel Prize in Physiology or Medicine with Bengt I. Samuelsson and John R. Vane in 1982. He earned his PhD from Uppsala University in 1986 for research investigating how the E19 protein of adenoviruses modulates the immune system. Pääbo is known as one of the founders of paleogenetics, a discipline that uses the methods of genetics to study early humans and other ancient populations. In 1997, Pääbo and colleagues reported their successful sequencing of Neanderthal mitochondrial DNA (mtDNA), originating from a specimen found in Feldhofer grotto in the Neander valley. In August 2002, Pääbo's department published findings about the "language gene", FOXP2, which is lacking or damaged in some individuals with language disabilities. In 2006, Pääbo announced a plan to reconstruct the entire genome of Neanderthals. In 2007, he was named one of Time magazine's 100 most influential people of the year. In February 2009, at the Annual Meeting of the American Association for the Advancement of Science (AAAS) in Chicago, it was announced that the Max Planck Institute for Evolutionary Anthropology had completed the first draft version of the Neanderthal genome. Over 3 billion base pairs were sequenced in collaboration with the 454 Life Sciences Corporation. This project, led by Pääbo, will shed new light on the recent evolutionary history of modern humans. In March 2010, Pääbo and his coworkers published a report about the DNA analysis of a finger bone found in the Denisova Cave in Siberia; the results suggest that the bone belonged to an extinct member of the genus Homo that had not yet been recognized, the Denisova hominin. In 2014, he published the book Neanderthal Man: In Search of Lost Genomes where he in the mixed form of a memoir and popular science tells the story of the research effort to map the Neanderthal genome combined with thought on human evolution. In 1992, he received the Gottfried Wilhelm Leibniz Prize of the Deutsche Forschungsgemeinschaft, which is the highest honour awarded in German research. Pääbo was elected a member of the Royal Swedish Academy of Sciences in 2000. In 2005 he received the prestigious Louis-Jeantet Prize for Medicine . In October 2009 the Foundation For the Future announced that Pääbo had been awarded the 2009 Kistler Prize for his work isolating and sequencing ancient DNA, beginning in 1984 with a 2,400-year-old mummy. In June 2010 the Federation of European Biochemical Societies (FEBS) awarded him the Theodor Bücher Medal for outstanding achievements in Biochemistry and Molecular Biology. In 2013, he received Gruber Prize in Genetics for ground breaking research in evolutionary genetics. In June 2015 he was awarded the degree of DSc (honoris causa) at NUI Galway. He was elected a Foreign Member of the Royal Society in 2016, and in 2017 was awarded the Dan David Prize. In 2018 he received the Princess of Asturias Awards in the category of Scientific Research. According to Neanderthal Man: In Search of Lost Genomes, Pääbo is bisexual – he assumed he was gay until he met Linda Vigilant, an American primatologist whose "boyish charms" attracted him. Currently, they are married and raising a son and a daughter together in Leipzig. ^ Pääbo, Svante (November 1993). "Ancient DNA". Scientific American. 269 (5): 60–66. ^ Candee, Marjorie Dent; Block, Maxine; Rothe, Anna Herthe (2007). Current biography yearbook. New York: H. W. Wilson. ISBN 0-8242-1084-0. ^ Kolbert, Elizabeth. "Sleeping with the Enemy: What happened between the Neanderthals and us?". The New Yorker. No. August 15 & 22, 2011. pp. 64–75. ^ "A Neanderthal Perspective on Human Origins" (video lecture). 10 September 2014. Retrieved 2014-11-15. ^ Gitschier, J. (2008). "Imagine: An Interview with Svante Pääbo". PLOS Genetics. PLOS. 4 (3): e1000035. doi:10.1371/journal.pgen.1000035. PMC 2274957. PMID 18369454. ^ Zagorski, N. (2006). "Profile of Svante Paabo". Proceedings of the National Academy of Sciences of the United States of America. 103 (37): 13575–13577. doi:10.1073/pnas.0606596103. PMC 1564240. PMID 16954182. ^ Dickman, S. (1998). "Svante Pääbo: Pushing ancient DNA to the limit". Current Biology. 8 (10): R329–R330. doi:10.1016/S0960-9822(98)70212-X. PMID 9601629. ^ Shute, N. (2003). "Portrait: Svante Paabo. The human factor". U.S. News & World Report. 134 (2): 62–63. PMID 12561700. ^ "Svante Paabo at the Max Planck Institute for Evolutionary Anthropology". Archived from the original on 2011-07-19. Retrieved 2011-07-27. ^ Pääbo, Svante (1986). How the E19 protein of adenoviruses modulates the immune system (PhD thesis). Uppsala University. ISBN 9155419216. OCLC 16668494. ^ "Svante Paabo publications in PubMed". Retrieved 2011-07-27. ^ "Edge: Mapping the Neanderthal Genome - A Conversation With Svante Pääbo". Retrieved 2011-07-27. ^ Krings, M; Stone, A; Schmitz, Rw; Krainitzki, H; Stoneking, M; Pääbo, S (1997). "Neandertal DNA sequences and the origin of modern humans". Cell. 90 (1): 19–30. doi:10.1016/S0092-8674(00)80310-4. ISSN 0092-8674. PMID 9230299. ^ Rincon, Paul (11 April 2018). "How ancient DNA is transforming our view of the past". BBC. Retrieved 11 April 2018. ^ Enard, W.; Przeworski, M.; Fisher, S. E.; Lai, C. S. L.; Wiebe, V.; Kitano, T.; Monaco, A. P.; Pääbo, S. (2002). "Molecular evolution of FOXP2, a gene involved in speech and language". Nature. 418 (6900): 869–872. doi:10.1038/nature01025. PMID 12192408. ^ Venter, J. C. (2007). "Time 100 scientists & thinkers. Svante Paabo". Time. 169 (20): 116. PMID 17536326. ^ Krause, J.; Fu, Q.; Good, J. M.; Viola, B.; Shunkov, M. V.; Derevianko, A. P.; Pääbo, S. (2010). "The complete mitochondrial DNA genome of an unknown hominin from southern Siberia". Nature. 464 (7290): 894–897. doi:10.1038/nature08976. PMID 20336068. ^ Green, R. E.; Krause, J.; Briggs, A. W.; Maricic, T.; Stenzel, U.; Kircher, M.; Patterson, N.; Li, H.; Zhai, W.; Fritz, M. H. Y.; Hansen, N. F.; Durand, E. Y.; Malaspinas, A. S.; Jensen, J. D.; Marques-Bonet, T.; Alkan, C.; Prüfer, K.; Meyer, M.; Burbano, H. A.; Good, J. M.; Schultz, R.; Aximu-Petri, A.; Butthof, A.; Höber, B.; Höffner, B.; Siegemund, M.; Weihmann, A.; Nusbaum, C.; Lander, E. S.; Russ, C. (2010). "A Draft Sequence of the Neandertal Genome". Science. 328 (5979): 710–722. doi:10.1126/science.1188021. PMC 5100745. PMID 20448178. .
^ Rincon, Paul (2010). "Neanderthal genes 'survive in us'". BBC. Retrieved 7 May 2010. ^ Lalueza-Fox, C; Gilbert, MTP (2011). "Paleogenomics of Archaic Hominins". Current Biology. 21 (24): R1002–R1009. doi:10.1016/j.cub.2011.11.021. ^ Wade, Nicholas (7 May 2010). "Signs of Neanderthals Mating With Humans". The New York Times. Retrieved 7 May 2010. ^ "Foundation For the Future has selected Dr. Svante Pääbo as the 2009 winner of the Kistler Prize". Archived from the original on 2011-07-26. Retrieved 2011-07-27. ^ "FEBS MEDALS: The Theodor Bücher Lecture and Medal". Archived from the original on 2011-07-26. Retrieved 2011-07-27. ^ "Gruber Genetics Prize for Svante Pääbo". MAX-PLANCK-GESELLSCHAFT. Retrieved 2013-04-06. ^ "ONE OF WORLD'S MOST INFLUENTIAL SCIENTISTS TO SPEAK AT NUI GALWAY". Retrieved 2015-06-13. Scholia has an author profile for Svante Pääbo. This page was last edited on 21 April 2019, at 00:20 (UTC).